This post may contain affiliate links. This means that if you click them, I may receive commission. This comes at no cost to you! There is probably nothing more in life that you love more than your pet. Well, maybe your boyfriend or girlfriend. My boyfriend and I have a cat named, Luna. If you’ve read my blog before, you may have heard of her. She is such an awesome cat that I wouldn’t trade for the world. Although Luna is the perfect addition to our lives now, it definitely took us a while to get to this point. I wish that we would’ve thought more into what having a pet meant for our relationship. Pets can really seem like having a child! 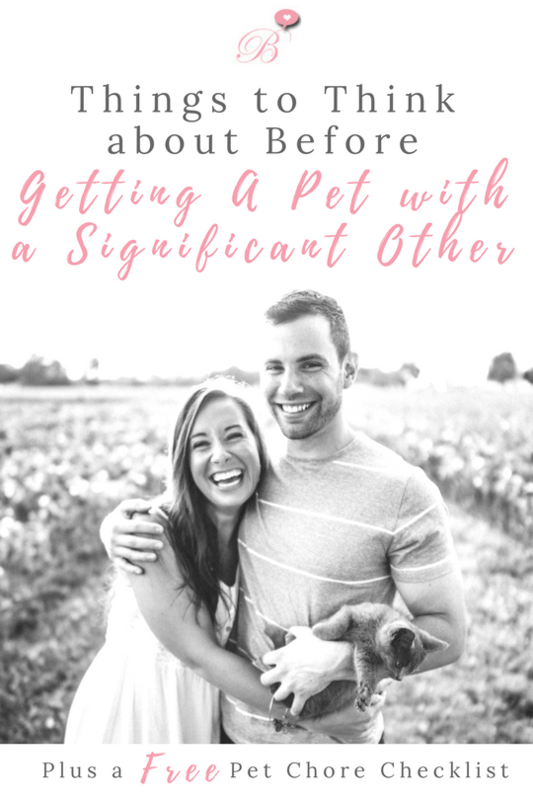 So, you and your partner should consider how having a pet can change things for your relationship. Thinking about adding a little fur ball to your life? Read these tips first! Having a pet can be a lot of fun, but it’s also a lot of work. You have to think about who is going to be doing this work. It’s not all playing and cuddling. If you are getting a dog, someone has to walk that dog and pick up the poop. For a cat, that litter box needs to be cleaned often. If you need help dividing up the chores, try my FREE Pet Chore Checklist which includes 6 different animal types! It also lets you decide on money decisions! Sign up below to get the checklist! You should be discussing money with your partner regularly, especially if you live together. Need another opportunity to talk about money? Get a pet! Pets need a lot of supplies. Food, leashes, litter boxes, vet appointments, toys, tanks, etc. If you want your pet to have a happy life, you’re going to need some dough. It will be better in the long run to decide now who’s going to pay for what before it actually comes time to do it. The last thing you want is to be arguing in the pet store about who is going to buy more of that expensive flea medicine that Mr. Snuggle needs. And if buying flea medicine really is a strain on your relationship or wallet, get 60% off certain brands through Entirely Pets! Pets require a lot of time and attention. That means less time and attention for your relationship. This is one thing that my boyfriend and I struggled with in the beginning because we didn’t realize how much time would be spent with Luna. Take time to really understand the time commitments needed to care for a pet. Be sure you’re okay with taking time away from your partner to spend on your pet. I don’t think anyone likes to talk about this. Pretty sure that Brad and I haven’t really talked about it. But, what happens to your pet if you break up with your significant other?! No one wants to think about the end of their relationship, but for the good of your relationship and pet, you have to think of it. Think of your pet as your child (which I’m sure you already do), what would you want for your child? Your partner and you need to discuss it, so when the time comes, you don’t have a big fight over your pet. This topic is a little sad for me. Mostly because it’s happened to us before. You may be faced to make a hard and large decision in your pets life. We had to decide on our pets life when she got really sick. We had a lot of emotional discussions during that time. Thankfully, we made all of the right decisions and Luna is healthy as ever. But, at the time, it felt like we just did something horrible. So, I advise you to take the time to decide what happens if you’re pet goes through something traumatic. Who has the say in what happens to the pet? It’s a hard discussion, but it may make things easier when time comes. On a lighter note, even small decisions can cause rifts in your relationship. The pet’s name, the grooming choices, the disciplining, and the food choices are all examples of things you may need to decide on. My advice is to talk about these things before you actually acquire the animal, hear your partner out on what they think is best, and if you cannot come to an agreement, don’t get a pet! At the end of the day, pets are really a fun part of the family. They just require a lot of responsibility. If you have a significant other, it will require both of you to make it work! Download A FREE Pet Chore Checklist!